In the picturesque Yas Marina Circuit, time arrived to separate the best from the rest. Vettel has claimed pole twice with Hamilton conquering it once of the three meetings in Abu Dhabi. It was likely to be a straight forward battle between Mclaren and Red Bull with Lotus threatening to be in the mix as seen from the practice outings, and can Alonso who clearly pushing his car to the limit, through an element of surprise? Since it’s a day-to-night qualifying, pitlane opened for q1 with track temperature reducing by nine degrees since the afternoon practice to 31-deg C. Grosjean and Kobayashi along with their midfield counterparts marched down the quirky pitlane exit which tunnels underneath and existed out of Turn 2 to start things off. Apart from Marussia and HRT, every other team headed into the session on medium tyres. Kobayashi was the first to set a timed lap after settling in for a few laps with 1:43.939s. Maldonado looked quick all weekend and straightaway four tenths up to go quickest ahead of Grosjean and Resta while the future team-mates Hamilton and Rosberg headed out of pits. Raikkonen was having a competitive car in a while and despite taking some tenths off in sector 1, he could only emerge second. Meanwhile, Alonso topped the timing screen with a very little margin of -0.021s before Maldonado disposed him off the top with a better run. Button was five hundredths down in his first run with Perez improving to eighth +1.13s off the lead. Hamilton had undergone persistent lock ups as he tried to overshoot the brakes and went off the road while Raikkonen moved up in the order to second with two tenths down on leader. Alonso suffered lack of grip in sector one all the time despite nudging ahead of the leader board with a better lap, two tenths up on Maldonado. Alonso, Maldonado, Raikkonen, Button, Hulkenberg, Grosjean, Schumacher, Massa, Perez and Rosberg top 10 after half the session completed. Vettel on his first run managed a p13 while a massive lock up encountered from Lewis’ car. Resta reported as saying disastrous traffic ahead while Williams’ Maldonado out brakes himself before bolting on a new set of softs. A blistering lap from Hamilton vaulted him up to the top with a stunning six tenths lead over his nearest rival with a time of 1:41.497s as Ron Dennis looked on. Vettel made some tiny errors which could’ve caused him so badly, locking up his wheels and almost shoving his car into the Armco after the exit of turn 19. With five minutes left on the clock, Hamilton led from Alonso, Massa, Button, Vettel and Maldonado with Webber down at p13. Webber committed himself and jumped out of drop zone to go second fastest, four tenths down on Hamilton. Senna, Ricciardo, Kobayashi, Resta and Vergne were in the danger of elimination and needed a quick lap of 1:42s. While Vettel’s lap helped him up to fifth, Vergne did his personal best lap, six tenths quicker than previous time on soft tyres, but not quick enough as he overcooked a kerb in final sector. He was asked to push for one more lap which didn’t help him either as found himself lining up on the grid with the usual suspects for eighth time this season. 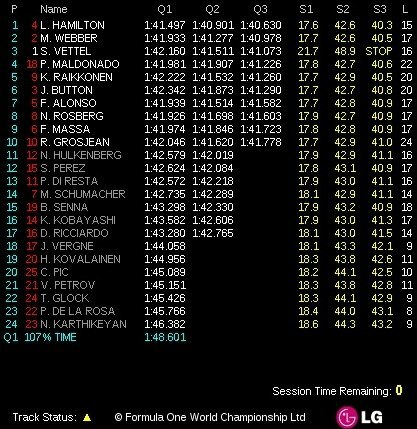 With Vergne nearly a second off of required time into q2, Rosberg from nowhere moved up to second. Vergne’s spin aided Senna and Perez as they almost came together while aiming to put a lap in before the time ran out. At the bottom, Charles Pic with an impressive lap split the two caterhams and out qualified his team-mate quite comprehensively. After seven cars eliminated, q2 was underway and the majority of cars including Kobayashi, Button, Hamilton and Massa headed on to the track quickly for a q3 berth. Resta set the early lap but Maldonado overhauled him for p1. Grosjean was looking quick all Friday and set a time seven thousandths up on team-mate Raikkonen. Rosberg took too much of kerb and let the underside spark when landed hard. Most of the teams switched over to yellow soft tyres when Raikkonen topped the timing board. Alonso lost a bit of time in sector 3 to see himself in second behind Hamilton who improved a tenth on his fastest q1 time. Vettel took a turn 12 side while Massa set a lap good enough for sixth. Sebastian Vettel replaced Alonso for second while Grosjean stayed in fifth. Webber beat Hamilton’s time to top the table but Hamilton dug deep again to enter into 40s mark with a 1:40.901. Force India drivers were not as quick as Maldonado’s Williams who loved this street-like track. Hamilton led from Webber, Vettel, Alonso, Grosjean, Raikkonen, Massa, Button, Maldonado and Hulk with three minutes left on clock and running. Kobayashi was five tenths down in p15 when Maldonado still languished in ninth. Paul di Resta hadn’t improvised and seemed as if his new chassis complemented him nothing. Senna disappointingly ended the session in 15th with four tenths down for q3 qualification. Mixed emotions in Mercedes garage as Rosberg managed to squeeze in and progressed while Schumacher apologised for getting confused with KERS harvesting. Alonso wanted a clear lap ahead and he got so until the final corner where Webber slowed down a bit. He reported on his team radio about this, but from the replay it was apparent that the Aussie was far ahead to influence on Alonso’s lap time, no lose or gain for the frustrated Fernando even though he felt so. It was all down to the final session, both Mclarens and Lotuses were first out on track and Raikkonen set the timing sheets alight. After most of the frontrunners set a timed lap, the order was like this Hamilton, Vettel, Webber, Alonso, Rosberg, Button, Kimi and Romain. Hamilton’s time of 1:40.630 looked comfortable for pole. With four minutes remaining, Massa was able to come up with a time four times shy of Hamilton’s for sixth. Maldonado put on a storming lap to stimulate the top four for another run as he sandwiched in between the Red Bulls. Webber kept it tight and went three tenths off the pace of leading pacesetter to go second while Raikkonen tried as much harder only to pull out a lap five tenths slower than Hamilton. 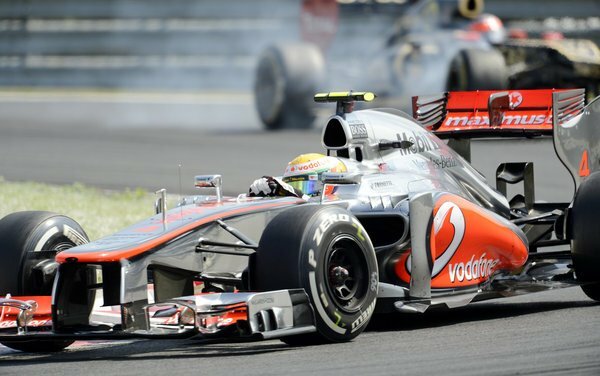 Button again found himself casualty to tyre degradation in the final stages as he went six tenths down on pole time. Rosberg out qualified his team-mate for the ninth time and will start the race from fourth row of the grid. It was Hamilton’s 25th pole with such a dominating drive in the twisty final sector. Webber may have hate to drive in here but despite the KERS issues and burning the undertray he incurred on Friday it was a rewarding second place. Thanks to Vettel’s penalty though, as all the cars on the grid will move up a place. Maldonado was credited with third, starts beside Raikkonen on the second row, quite alarming. Button and Alonso share the third row ahead of Rosberg and Massa with Grosjean and Hulkenberg rounding out the top 10. As for penalties, Reprimand for Perez’s impediment of Senna in q1. But stopped in the in-lap and as a result had to face the consequences as he was asked to. It took four and half hours to investigate and decide on Vettel’s matter after he visited the stewards panel for inquiry. According to Article 6.6.2 of FIA Formula One Technical Regs, the car 1(Vettel) was investigated as it didn’t return to pits under its own power. The stewards accepted the hearing from concerned staffs and driver and considered it as a force majeure(unexpected event). But they couldn’t agree more on Red Bull’s claims. As per the same article, they apparently breached the fuel sample regulation. Stewards said Vettel’s car had 850 ml fuel on board which was not enough for the required one litre fuel sample. Therefore, he was excluded from the qualifying result and allowed to start from back of the grid. However, Vettel will start from the pitlane it appeared to have. “It is an issue that was reported on the in-lap. The instruction from Renault was clear. They wanted us to stop the engine immediately due to an issue that they saw within the fuel cell. We did that. “The FIA accepted that, they accepted the technical issue that Renault reported to us, and unfortunately as the regulations dictate there has to be a one litre fuel sample to be able to taken from the car, and it is only 850ml that has been extracted. He added: “It is a frustrating scenario and we need to get into the fuel cell to understand what the issue is. We are working with Renault on it, and they dictate the amount of fuel that goes into the car. This has changes the whole landscape of the championship. Alonso could arguably have felt a shy of relief as his main championship rival is thrown out of qualification. This is a mega turnaround on this spectacular season where we have already had seven different drivers winning as much races since Melbourne. Despite having two DRS zones, overtaking is highly unlikely at Yas Island. Though Vettel will push as hard as he can, Alonso’s car is vulnerable on sector 1 so he needs to bag as much points as possible from p6 to close the 13 point gap that exist.